The USP of the dish for me is the earthen pot that is used in this preparation. The idea of cooking in an earthen pot has always seemed so fascinating and thrilling to me. I had experimented couple of times in past, cooking in a Handi (earthenware) trying different preparations but the outcome was a mixed one. On one occasion the Handi with the Biryani inside had developed a wide crack on its bottom and I was left with a pot full of half cooked Biryani which was difficult to reclaim. The disastrous experience had me avoid the idea of using Handi in my kitchen for some time and it compelled me into blacklisting the potter who had duped me into buying a substandard pot. However, after a brief hiatus, I began thinking of using an earthen ware one more time, albeit with a different preparation. It was with this thought, I began to experiment with recipe of Chicken Handi. 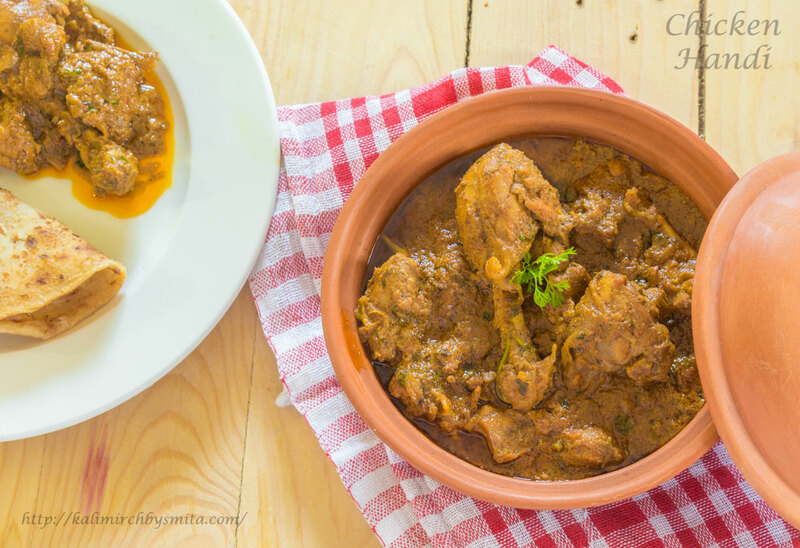 After few tweaks in the recipe that I had jotted down in my food-diary that I began to maintain almost a decade ago, I had finalized this recipe of Chicken Handi. 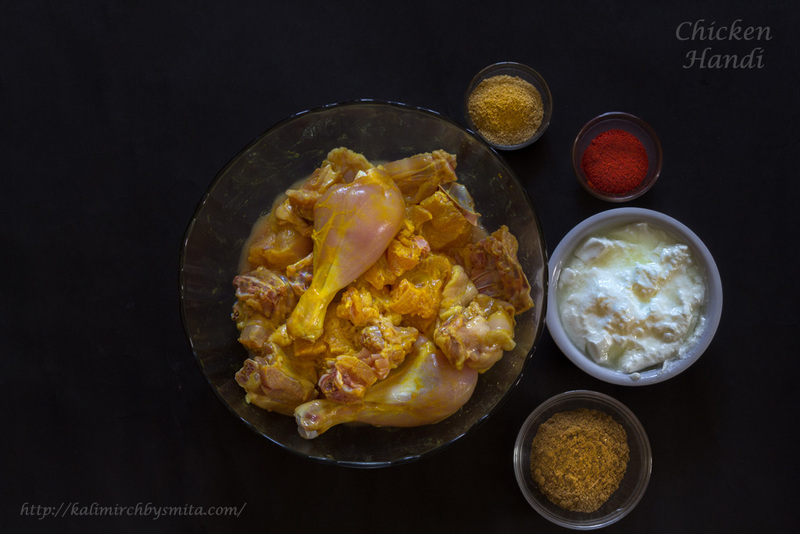 The first marination comprises of turmeric, salt and lemon juice. Chicken is left in this marination for half an hour. The second and the more elaborate marination requires us to add a spice mix (masala powder) of whole spices which are dry roasted and grounded into a fine powder. The other ingredients required in the marination are red chili powder, coriander powder and Curd. Chicken is kept in this marination for an hour. Handi or the earthen pot must be seasoned correctly before you could use it for your regular cooking. The more often a clay pot is used for cooking, faster it would become ‘fully seasoned’. I am going to share a blog and put up a video on our channel depicting steps to be taken for seasoning a clay pot quite soon. One important caveat that must be mentioned, that I have learnt over the years, is that food must not be cooked on high heat in a clay pot. It is most typically suitable for cooking on low to low-medium heat. Sliced Onions and tomato puree weighing one fourth of the total weight of Chicken is used in the recipe. The marinated chicken is then added to the clay pot and cooked with the lid on. A significant point to be mentioned here is that this recipe does not requires addition of water for the gravy. Chicken gets cooked in its own juices besides the moisture incorporated by curd and tomato puree. The dish typically must have a thicker consistency, but you can alter the consistency to suit your palate. Chicken cooked on a slow heat in an earthen pot, simmering in its own juices until it is done- is what a foodie’s dreams are made of. Chicken Handi can be relished with Laccha Paratha, Naan, Phulka or steamed rice. 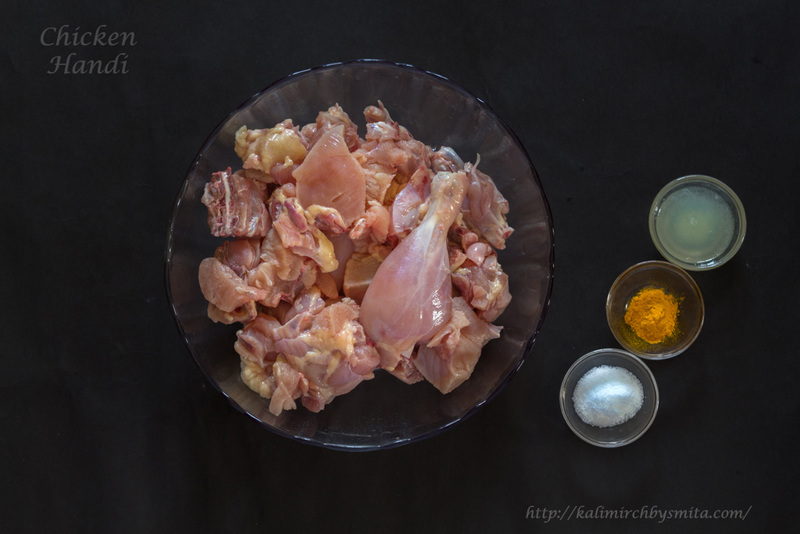 Let's perform Chicken's first Marination: Add 1 tsp. Salt, ½ tsp. Turmeric Powder, Lemon Juice and mix well. We will keep Chicken in this marination for 30 minutes. We will dry roast Whole Spices. In a pan, add Bay Leaf, Cinnamon stick, Peppercorns, Black Cardamom, Green Cardamom, Cumin Seeds and Cloves. Dry Roast lightly. 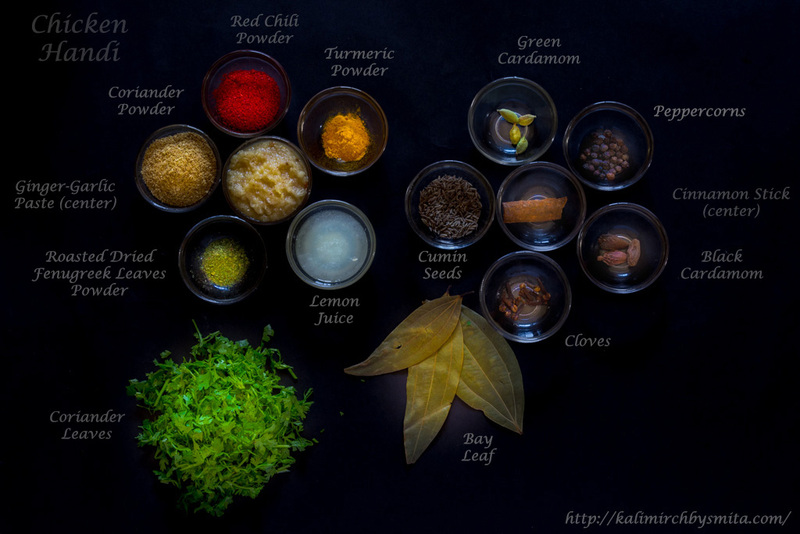 As the spices release aroma, switch off the heat and grind it into fine powder. Lets prepare for second marination: Add roasted and grounded spice Mix, Red Chili Powder, Coriander Powder and curd. Mix well. Cover with a Cling Film and keep the chicken in this marination for an hour in refrigerator. Take marinated chicken out from refrigerator. We will make this preparation in an earthen pot. Heat 4-5 tbsp. Oil and add sliced Onions. Fry until Onions become brown in color. When Onions become brown, add ginger-garlic paste and fry for a minute. Add Chopped Coriander Leaves and marinated chicken. Roast Chicken on high heat. After 5 mins of roasting, add tomato puree and salt to taste and mix well. Cover and cook the Chicken on reduced heat. After 10 mins, stir the chicken. We have not added any water in this preparation. Chicken gets cooked in its own juices, and the moisture from curd and tomato puree. Cover and cook for remaining time. Chicken gets cooked in total 25 minutes. You can adjust the consistency of the final preparation. If you require thick consistency, then cook uncovered for 3-4 minutes. Add roasted dried fenugreek leaves powder and mix. Chicken Handi is ready to be served. Flavor of Chicken cooked in an earthen pot on low heat in its own juices is delicious. Chicken Handi can be relished with Laccha Paratha, Naan, Phulka or Steamed Rice. Hi!! 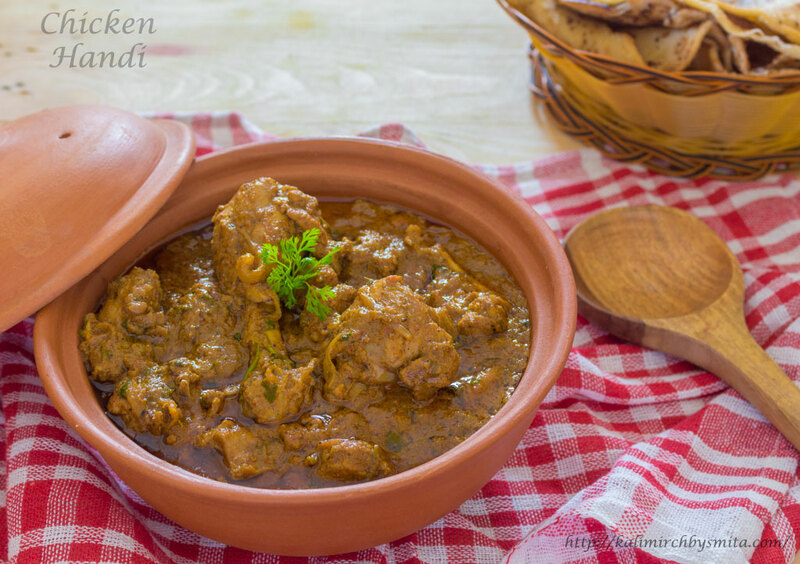 Chicken handi looks really tempting, but can we cook without earthen pot? Will it still get the good flavor. Hey Sangita , thanks for stopping by ! 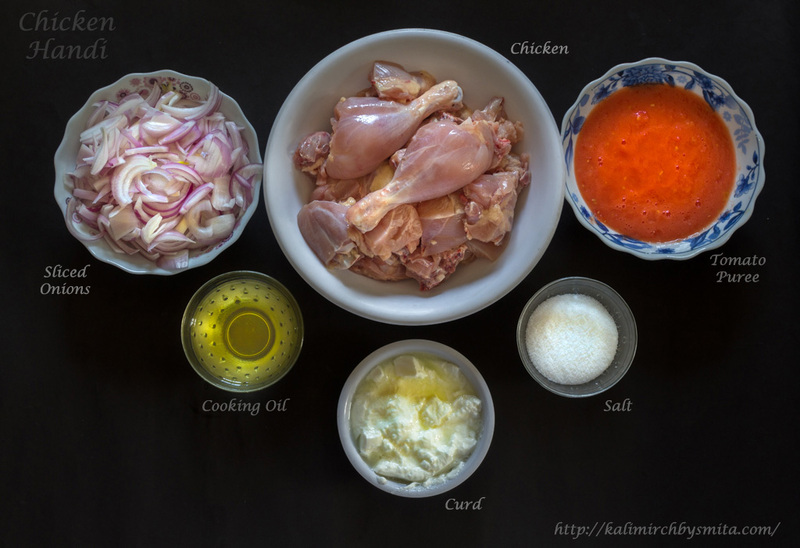 Yes you absolutely can make this chicken curry in other utensils , it will taste awesome. Rather I would say your efforts will make that chicken handi tastes delicious irrespective of utensils used , what say my dear reader? 🙂 Just give it a try and let me know your experience!